Garmin’s fenix 5 Plus Sapphire GPS Watch is a top choice for outdoor adventurers! A Sapphire glass lens resists scratches and the all black design can be work from a workout to the office. Preloaded Topo Maps, Garmin Pay and More! Stylish watch for all outdoor adventures! Garmin's fenix 5 Plus is ready for adventure when you are! A rugged yet stylish watch, the fenix 5 Plus comes with GPS, GLONASS and GALILEO satellite compatibility ensuring you can track your position even in the most challenging environments. Preloaded with Topo Maps, Garmin Pay, Round Trip Run and Ride and much more. The fenix 5 Plus is a top choice sports watch. Whether you are hitting the pavement for a run, Swimming laps, Golfing or even Paddle Sports - this watch does it all. For Navigation and Tracking, the fenix plus has Multisatellite networking with GPS, GLONASS and GALILEO ensuring accurate position as well as ABC Sensors. Altimeter, Barometer and Compass. The built-in altimeter for elevation data and barometer which can be used to predict weather changes by showing changes in air pressure and don't worry about losing your heading, with the 3-Axis Electronic Compass you will know your bearing whether you're moving or standing still. It doesn’t stop there though, preloaded Topo Mapping comes standard in the fenix Plus models and Full color topo maps will help navigate you safely no matter where your adventure takes you. No longer is it necessary to take your iPod along for your next adventure. 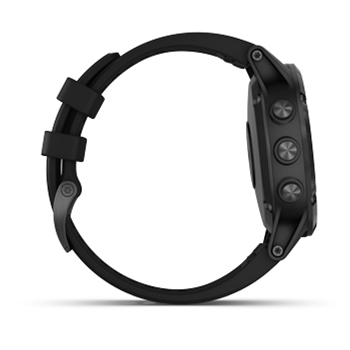 The fenix plus can store up to 500 songs right on your wrist and will connect with a pair of Bluetooth headphones (sold separately) limiting the amount of items you need to bring along. Plus, with Garmin Pay you can store credit card information on your watch and leave your cash and cards at home and pay right from your wrist. Add to that the ability to receive smart notifications, including texts, emails and alerts on your watch whether you’re on the trail or in the office the info you need is only a glance away. 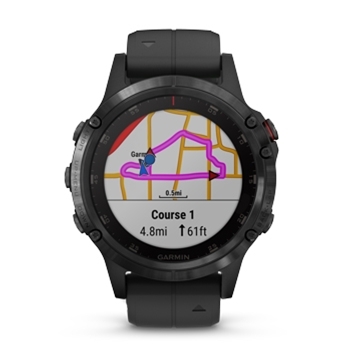 Wi-Fi enabled the fenix plus also allows for automatic uploads to Garmin Connect when connected to wireless networks. Garmin Connect not only can store you info but it enables live track which will allow friends and family to track you in real time and when you're out with your friends on an adventure you can use the GroupTrack feature which allows you to keep tabs on up to 5 of your friends and always know exactly where they are. 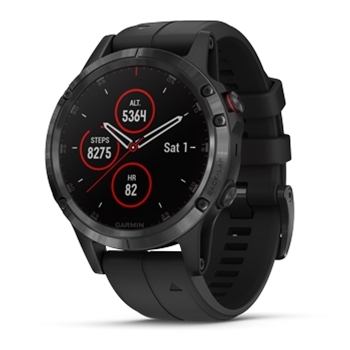 Loaded with features the fenix 5 Plus includes wrist based heart rate, round trip run or ride enabling you to enter a distance you want to go and your fenix plus will do the rest by suggesting an appropriate course for you. At-a-Glance guidance provides banners on the watch face showing upcoming turns and Data overlays on map screen highlights key information eliminating the need to switch screens. On the trail or in the office. The rugged fenix 5 has a battery life up to 12 days in Smartwatch, up to 8 hours in GPS mode with music and up to 42 hours in UltraTrac Mode. Wear day or night in the gym or at the bar - With the Black on black rugged design, the sapphire lens resists scratches and can withstand water to 100 meters without causing damage to the watch.